Perform experimental “events” — no experience required! Familiar with Fluxus? You don’t have to be to enjoy this hands-on event. Here’s what you need to know: Fluxus is an international and interdisciplinary group of artists, composers, designers and poets that took shape in the 1960s and 1970s, and this evening is dedicated to exploring their handbook. As an attendee, you’ll have the opportunity to perform experimental “events” ranging from eating an apple on stage to exploring neo-dadaist noise music and maybe even ravaging a violin with a saw! Bernstein believed that art and artists could change the world. Now, you can participate as the artist. 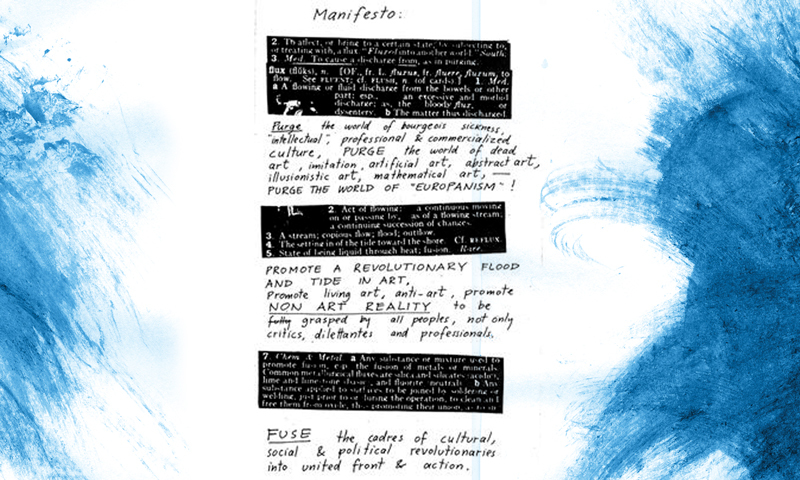 Fluxus, a radical and experimental performing arts movement from the 1960s, allows art to be created democratically. Perform short performance art pieces, from eating an apple on stage to screaming out a random word.